FILE - U.S. Ambassador to Russia John Tefft is pictured at the Kremlin in Moscow, Nov. 19, 2014. The outgoing U.S. ambassador to Russia, John Tefft, has defended the expulsion of Russian diplomats from seized consular property in the United States amid an increasing strain in diplomatic ties. In a joint interview Wednesday in Moscow with the Russian services of VOA News and Radio Free Europe/Radio Liberty, Tefft rejected statements in Russian media that the seizing of diplomatic property in San Francisco, New York and Washington was done in what Russian President Vladimir Putin called a "boorish and unprecedented" fashion. 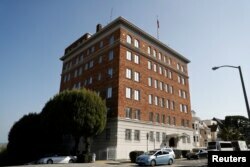 Putin accused U.S. authorities of threatening to "break down the entrance door" of the Russian Consulate in San Francisco after Washington set a September 2 deadline for the premises to be evacuated. "Nobody broke down doors. Nobody put undue pressure on people. It was all done very, very carefully — and, in compliance with the Vienna Conventions," Tefft said. Speaking in China on Tuesday, Putin said, "Let's see how well the much-praised American legal system works in practice." Russian Foreign Minister Sergei Lavrov told his U.S. counterpart, Secretary of State Rex Tillerson, in a telephone call on Wednesday that Russia had initiated legal proceedings for what was a "violation of international law." FILE - The entrance to the building of the Consulate General of Russia is shown in San Francisco, Aug. 31, 2017. U.S. President Donald Trump reduced Russia's consular facilities this month after the Kremlin demanded the U.S. cut its diplomatic staff in Russia to 455 people. Russia said it was imposing the demand as a countermeasure to new U.S. sanctions over alleged Russian interference in the 2016 election and to achieve "parity" with the level of the Russian diplomatic presence in the U.S. Trump's closing of the Russian consulate and two annexes brought the number of Russian diplomatic facilities in the U.S. even with the number of U.S. facilities in Russia. "But when we used parity to withdraw our consent for the Russian government to have a consulate in San Francisco, then everyone got all excited. And, you know, parity is parity," Tefft noted. Russia's Foreign Ministry gave conflicting statements, implying that the U.S. had voluntarily reduced its staff, a notion also rejected outright by Tefft. However, Tefft said in the interview that it was false to suggest that Washington "negotiated or somehow signed on to the idea of reducing our staff." "We were told to do that. That was not something that was negotiated," he said. Russian officials say they are considering how to respond to the reduction of their U.S. consular facilities. FILE - U.S. 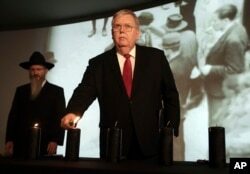 Ambassador to Russia John Tefft lights a candle at a ceremony marking the International Holocaust Remembrance Day in the Jewish Museum and Tolerance Center in Moscow, Russia, Jan. 27, 2017. At left is Russia's chief rabbi, Berel Lazar. Despite the downward spiraling diplomatic relations, Tefft has urged Russia to join U.S. allies in Asia and Western governments in pressuring North Korea to end its nuclear weapons program. "While the focus, at this point, is on the United States, I noted one of the earlier missiles a few weeks ago, you know, landed 60 kilometers off of Vladivostok in the water," Tefft said. "This is a regional and now becoming a global threat. It's not just against the United States, it's against all of us. "One of the things that Secretary Tillerson and Foreign Minister Lavrov agreed, when they saw each other here in March, was that the United States and Russia both believed the Korean Peninsula should be non-nuclear.That's a fundamental which we can work on," Tefft added. The U.S. ambassador said there had been regular consultations between U.S. and Russian experts on North Korea and that he expected more in the next few weeks. "Now, getting forward, we've got to try to find the best tactics to do this. But we need strong efforts by Russia and China if we're all going to be successful," he said. Tefft is expected to leave Russia this year and be succeeded by Trump appointee Jon Huntsman, a former U.S. ambassador to China. VOA's Danila Galperovich contributed to this report.